Son Bonyola is a vast estate on the north west coast of the Island and covers 680 acres of breathtaking landscape. It includes three luxury villas, Sa Punta de S’Aguila, Sa Terra Rotja and Son Balagueret. These villas can be booked independently or as a whole for large groups looking for the privacy of their own villa but with friends and family nearby. Central to the estate is a large historic manor house. The building is currently unused and is a World Heritage Site. This gives the villas a stunning backdrop alongside the rugged rock faces of the Mallorcan coastline. The estate is located just a few kilometres from the Mallorcan villages of Banyalbufar and Esporles. These traditional villages have a range of local amenities including a variety of restaurants and typical Spanish tapas bars. The capital of Mallorca, Palma, is just 25km from Son Bunyola so accessing the larger city is easy. A hire car is recommended, mainly as this gives you the opportunity to explore this beautiful part of the island. Palma airport is just 40 minutes from the estate and there are a range of flight options from most main European airports daily. Each villa is very unique in their own way. All are offered on a fully catered basis with your own team of staff on hand to ensure that your every need is taken care of. Sa Punta de S’Aguila translates as Eagle’s Point. The villa sits in a commanding location on a track above the rugged coastline below. 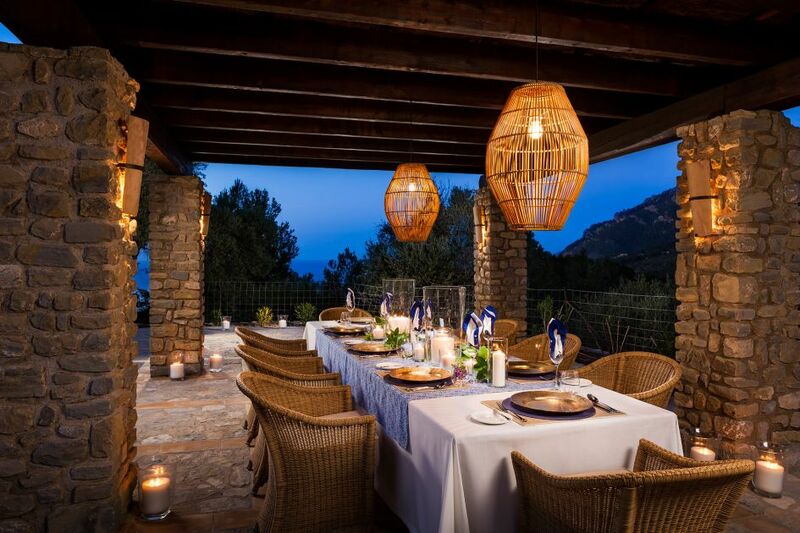 The villa is built in a style reminiscent of other typically Mallorcan villas. The villa has cooling tiled floors and high ceilings with exposed wooden beams. The villa blends effortlessly into its surrounding and the focal point from the main terrace is the amazing panoramic view of this beautiful stretch of coastline. The 15m heated swimming pool is the main external feature, where you can relax with a refreshing drink whilst taking an occasional dip to cool off. Sa Punta de S’Aguila has 5 en-suite bedrooms, all of which have their own terrace complete with a table and 2 chairs. 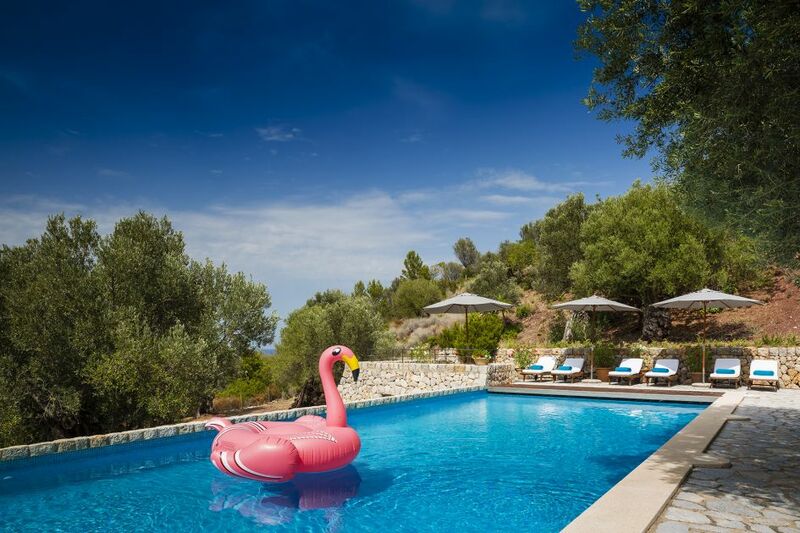 The villa is ideal for 10 people or a couple of families looking for a luxury villa holiday in Mallorca. Prices start from €22,375 EUR per week on a fully catered basis. Sa Terra Rotja means Red Earth in the local Mallorquin language. This lovely villa has 4 en-suite bedrooms so can comfortably sleep 8 people. The villa has an amazing terrace with breath-taking vistas of the coastline and forests surrounding you. The 15m heated outdoor pool is a haven from the mid-day sun whilst the cool interiors of the villa feature a large living/dining area, although people prefer to dine on the large outdoor terrace to make the most of the picture-postcard views. The grounds of the villa are set up with hammocks and are impeccably landscaped and well maintained. Prices start from €17,900 EUR per week on a fully catered basis. Son Balagueret is another traditional villa that benefits from the stunning views surrounding the estate. This villas can sleep up to 8 people in 4 en-suite bedrooms. This villa is steeped in history. The turrets of the building date back to the 13th century and small slotted secret windows would have been the lookout points for attackers. The house has a central courtyard which aids the feeling of spaciousness and allows refreshing sea air to blow throughout the villa. One bedroom is located within the villa’s turret, with a curved stairwell leading from a shared bathroom on the lower level, up to the first floor sitting room and then on to the upper level bedroom. It truly has a fairy-tail feel to it. Prices start from €13,425 EUR per week on a fully catered basis. The joy of staying in any of the villas located within the Son Bunyola estate is that you have a team on hand to ensure that your holiday is peaceful and the only thing you have to think about is occasionally topping up your sun cream. Each villa comes with it’s own chef who is on hand to treat you to local delicacies. This region of Mallorca has an abundance of beautiful fresh produce. You can expect fresh fruits, the most organic of salads and meats and fish from the local markets. The chef and hostess will be on hand for a buffet style lunch, a 3 course evening meal and will leave out a daily continental breakfast, giving you the chance to raise from your bed at your leisure. All drinks, including alcoholic beverages, are included and you are welcome to help yourself. Try some of the local wines, handpicked by the team. If you have a favourite tipple, let us know and we’ll endeavour to have it stocked up for when you arrive. Some people like to kick back and relax when staying in the estate whilst others prefer to be active, get out and about and explore. So what kind of things can you enjoy doing during your stay at Son Bunyola? There is a tennis court next to Sa Terra Rotja which is shared by all three villas. Equipment is provided and lessons can be arranged on request. Each villa has it’s own table tennis table. Who will be the winner in your household. Ping pong is highly addictive and is likely to unleash your competitive side. There is a small pebble beach within the Estate. Hikers enjoy walking the famous coastal path as it’s nice and quiet. To walk to the beach will take 20 minutes from Sa Terra Rotja and Sa Punta de S’Aguila or 40 minutes from Son Balagueret via Sa Terra Rotja. 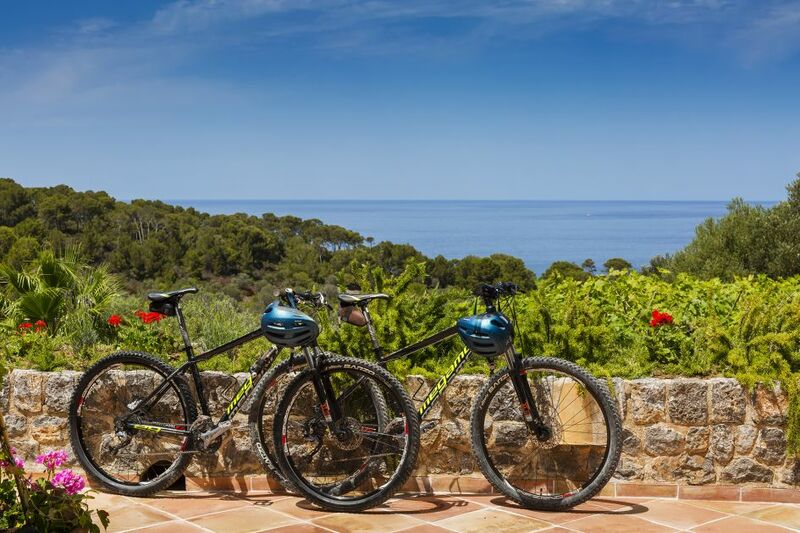 Cycling holidays in Mallorca are becoming increasing popular with people looking to train in a warmer climate. If however you just fancy a casual ride around the local roads and tracks then this is possible too. Whatever you fancy, the team at the villas can help you hire the right bikes. The area is perfect for tranquil walks. As the estate is 3km x 5km there are plenty of walks within the estate itself. Alternatively you can walk to the beach and join the coastal path. Walks to the local villages can also be enjoyed. How does receiving a relaxing massage in the shade of a large tree whilst the wind blows through your hair sound? Massages can be arranged on request. There are over 20 golf course available in Mallorca. 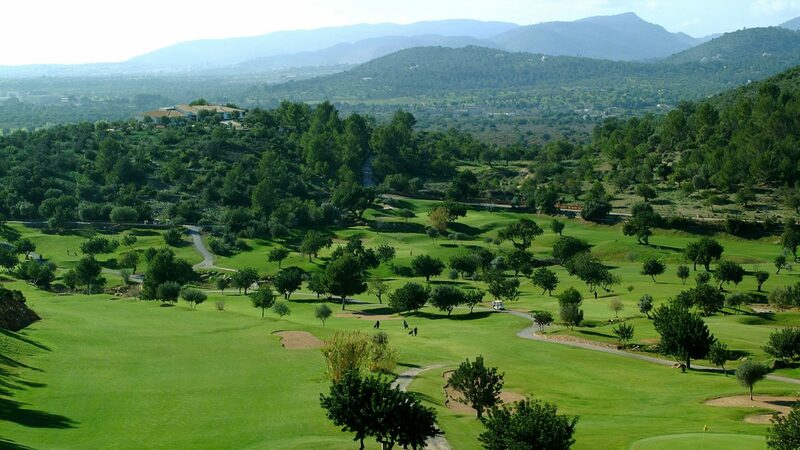 The nearest course is Golf de Son Termens which is just a 30 minute drive from the estate. The course enjoys lovely views and the villa team will be happy to book you a tee off time if required. Mallorca has an idyllic setting in the tranquil Mediterranean sea. The Island is popular with sailors of all abilities and the villa staff are happy to match you up with a skipper for the day so you can head out and enjoy these beautiful typically calm waters. If you prefer to feel the water closer at hand then a kayaking or canoeing trip is the perfect way to cool down on a warm sunny day. A sea-kayaking trip provides the perfect opportunity to see this beautiful rugged coastline. As well as sailing, Mallorca is also popular with those who enjoy deep sea fishing. A day out on the water offers the perfect opportunity to catch a fish for the bbq that evening. All 3 villas come with their own swimming pools. They can be heated if required and provide the perfect place to cool off on a hot summer afternoon. You may even find you have a big inflatable plastic friend looking to join you if the photo below is anything to go by. 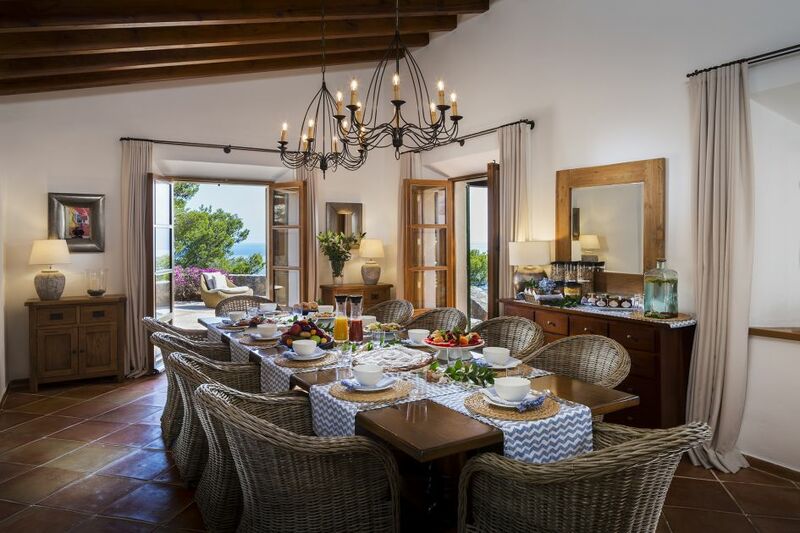 The next time you’re looking for a luxury holiday in Mallorca, make sure you consider a stay in one of the villas on the Son Bunyola estate. A stay in these villas can be as active or chilled out as you’d like. These beautiful villas have everything you need for your ideal holiday in the sun. With a team of staff on hand, the only decision you’ll have to make is whether you’d like a glass of white or a glass of red. If you’d like any more information on any of the villas within the Son Bunyola estate or if you’d like to know any information about this beautiful area of Mallorca then you can call us on +44 (0) 1202 203 656 or alternatively send us an email.